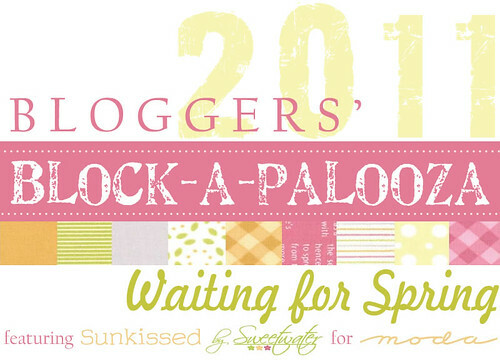 Here is what John wrote up for our intro…..
18 quilt bloggers have collaborated to bring you the first-ever Bloggers’ Block-a-palooza. 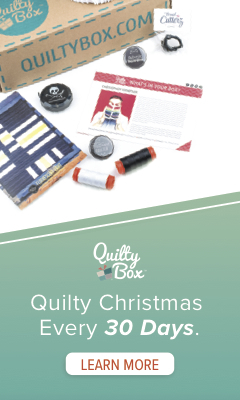 We’ll jump from blog to blog making 2 quilt blocks per week, wrapping up with a custom setting and layout design to help complete your quilt. 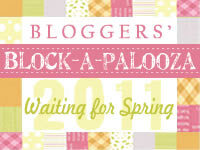 I am so excited to be one of the participating bloggers. We’re calling this quilt-along “Waiting for Spring” because we’ll be using the brand new Sunkissed line by Sweetwater for Moda, and the bright colors and botanical prints should help you (or at least those of you in the Northern hemisphere!) push through the cold winter months and have a fresh new quilt ready for the Spring. Okay so there are how many days left til Christmas, now?? Oh my gosh, I am SOOOO not ready still…. Cool. I’ll be looking forward to future posts on this adventure.